Nate Fowler puts up a shot. 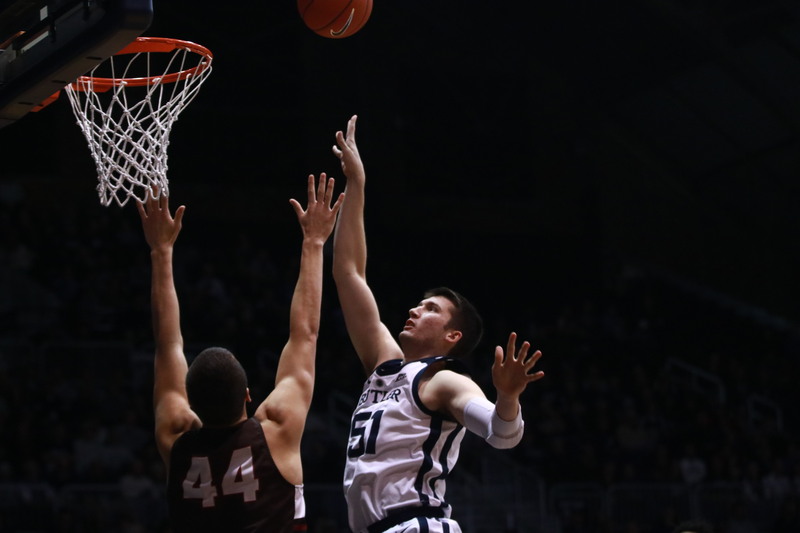 Folwer and the Bulldogs welcome St. John’s to Hinkle Fieldhouse on Jan. 19. Jimmy Lafakis/Collegian file photo. Coming off a crucial road win at DePaul, the Butler men’s basketball team returns to Hinkle Fieldhouse to play host to the St. John’s Red Storm as part of Basketball Day Indiana. Also included in the celebration of Indiana basketball is the Purdue-Indiana rivalry game, five high school basketball games and the Pacers-Mavericks game where the great Bobby “Slick” Leonard will be honored. Here’s what you need to know for Butler’s matchup. Shamorie Ponds in the heart and soul of St. John’s. If it wasn’t for what Markus Howard is doing at Marquette, Shamorie Ponds would be the front-runner for Big East Player of the Year. The junior is averaging 20.6 points, 4.3 rebounds and 5.9 assists while shooting 50 percent from the field and 40 percent from deep. There is a direct connection between Ponds struggling and the Red Storm struggling. In two of St. John’s three losses, Ponds has either struggled mightily or didn’t play in the game. Against Seton Hall, Ponds was 2-for-13 from the field with only eight points and five turnovers. In St. John’s most recent loss at home to DePaul, Ponds sat out with a lower back strain. It’s not hard to figure out how to beat St. John’s, but it is very difficult to go out and slow down Ponds, especially with the supporting cast around him. Ponds is the guy, but the St. John’s attack is very balanced. The offense just runs differently when Ponds is on the floor, but there are absolutely more dangerous players that make up this explosive Red Storm offense. All five St. John’s starters average in double figures, four of them shoot better than 39 percent from the 3-point line and they are responsible for an average of 72 points per game. It is a daunting task for Butler’s offense to try to stop all five players. They can either focus on stopping Ponds and forcing the other four to score enough points to win or leave Ponds stranded on an island as the only guy scoring. If Butler allows Ponds to score 27 and the other four guys to score 15 each, it will probably be a long day for the Bulldogs. St. John’s firepower versus Butler’s depth. If you’ve watched Butler this season, it’s clear they don’t have the firepower that St. John’s has. But they do have depth the Red Storm don’t. The question is, will you get more from Butler’s depth or from St. John’s firepower? The Bulldogs have eight players on their roster playing 17 minutes or more per game and only one player averaging more than 30. On the flip side, St. John’s starters all average 29 minutes or more per game and only two guys come off the bench playing real minutes. If Butler can slow down two or three of St. John’s starters, there isn’t a lot of firepower waiting behind them to pick up the slack and that’s where Butler can gain an edge.